New York Mets pitcher Noah Syndergaard, who started on Opening Day, will be put on the team’s 10-day disabled list on Wednesday due to a strained index finger on his right hand. Syndergaard saw a doctor on Tuesday in New York after his index finger on his right hand became sore. The move on the DL will be retroactive back to May 26. 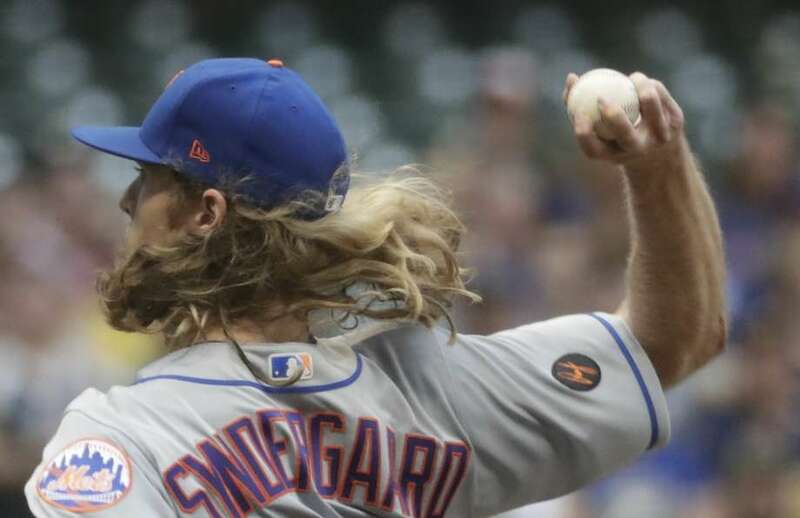 Mets manager Mickey Callaway said that Syndergaard threw a side on Monday and that is when the pitcher began noticing that his finger became worse. There was bruising near the base of his right wrist as well, and Callaway said the team decided the pitcher needed to have it checked out. Callaway also said that Syndergaard had felt slight soreness following his last start and a splint would be put on the finger in order for it to remain immobilized. Callaway seems to think that Syndergaard would not be sidelined for very long. The Mets manager said that at this time the goal is that he rest a few days and during this coming weekend have him in the bullpen and following that he should be fine. The stint on the DL for Syndergaard is just more bad news for the Mets. The team has been besieged with injuries and are already without power hitter Yoenis Cespedes, starting third baseman Todd Frazier and catcher Travis d’Arnaud, outfielder Juan Lagares, infielder Wilmer Flores and two relievers Anthony Swarzak and AJ Ramos. Syndergaard was scheduled to start on Wednesday against the Braves in Atlanta. However, Jason Vargas will take his place on only three days’ rest. Vargas started on Saturday but pitched just three innings. On Thursday, the Mets will start Seth Lugo. Syndergaard, who is just 25, has started the season strong after sitting out the majority of 2017 due to a lat injury. In his 11 starts, the right-hander is 4-1 with an ERA of 3.06 with 76 strikeouts in 64 2/3 innings of work. On Tuesday, things seemed to be going well as the Mets jumped out to a 4-0 lead over the Braves, but after warming up to start the fourth inning starting pitcher Steven Matz summoned the team’s training staff to the pitcher’s mound. He was taken out due to discomfort of the middle finger of his pitching hand (left). X-rays off the finger came back negative and no word has been released by the Mets as to how long Matz might be sidelined beyond Tuesday’s game. He may not even miss a start, said one team source. New York went on to squander the four-run lead and lose to the Braves 7-6.